Pick any measure of Apple’s (NASDAQ: AAPL) profitability you want and it will point you toward one conclusion: the business is a license to print money. Over its last six full financial years the business of selling iPhones, Macs, iPads, Apple Watches and assorted services (e.g. Apple’s cut of app sales, TV shows downloaded on iTunes, and so on) has generated $330 billion worth of “free” cash. The figure is so astonishing I had to triple check it. Remember this is cash left over solely to return directly to shareholders and/or buy other businesses, pay off debt or else let accumulate in bank accounts across the world until the company figures out what to do with it. (In reality Apple has plowed around $170 billion into longer term investments like corporate bonds). Despite the above there is a recurring annoyance that regularly crops up in Apple stock discussions: valuation. It has become an established fact that Apple regularly trades “cheap”. What do I mean by that? Well, let’s just compare Apple to some of its peers in the tech sector. Amazon, for example, currently sports an enterprise value to EBITDA ratio of around 30. Alphabet (the holding company that owns Google) sports an EV/EBITDA ratio of around 19, while Microsoft’s clocks in at 15. Facebook stock, despite losing a quarter of its value over the past six months, still trades at an EV/EBITDA of 13. 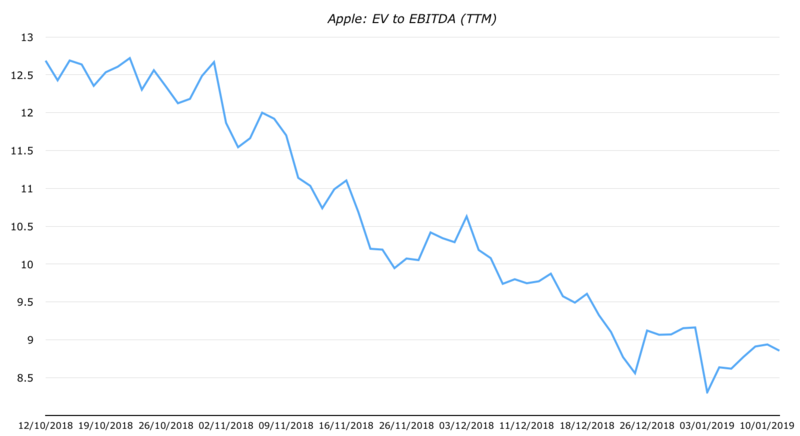 Apple, in contrast, has a current EV/EBITDA value of just 9. Ultimately, that huge difference boils down to one thing in my view: Apple tends to report lumpier earnings figures than most of the service based companies listed above. Perhaps the market simply doubts the longevity of Apple’s products/services versus other large tech companies. Either way it seems unreasonably cheap. I mean right now Apple trades at earnings yield of just over 8%. It has $235 billion worth of cash, cash equivalents, short-term investments and long-term investments sitting on its balance sheet versus $115 billion worth of total debt. It plans to return that difference directly to shareholders. On that note it’s worth mentioning the share buyback program going on here. Back in 2013 Apple had a total of 6.5 billion shares in existence. That figure is currently around 4.75 billion. (If you run through the math you will find it is the same as boosting earnings per share by around 4.5-5% per year). The total cash bill for eliminating 1.75 billion shares over that time frame? $235 billion. Cash dividends to shareholders took up a further $72 billion. We could therefore say the total amount spent on returning cash to shareholders was in the region of $305-$310 billion. As large as that number appears, amazingly it is still less than the number I presented in the first paragraph: $330 billion. That was the total free cash flow generated by the company over the same period. So what do those numbers mean for investors? 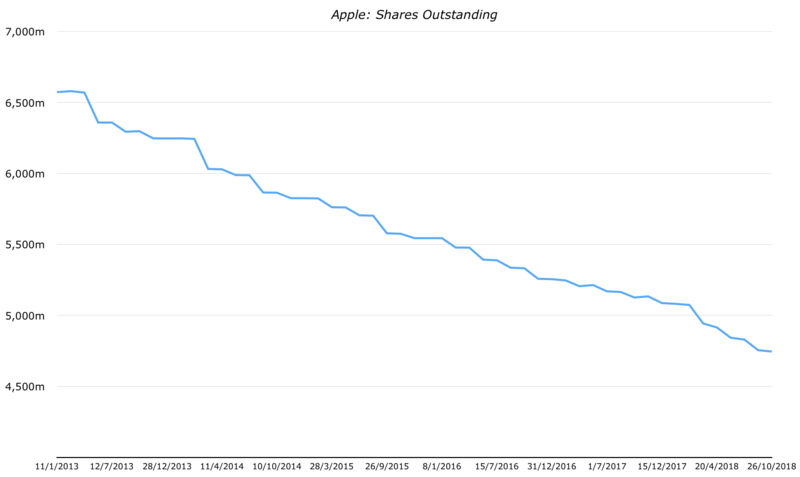 In short it appears that Apple can probably return 50% of its current market value to shareholders over the next few years without breaking a sweat. That’s before taking into account any growth assumptions. It isn’t even including the $120 billion plus balance sheet ‘surplus’ I mentioned above. Even if you are unsure about Apple’s long-term prospects (who is confident enough to make predictions regarding technology after all) there seems a good chance that the stock will deliver solid shorter term returns.